Accra, Feb 9, GNA - Kumasi King Faisal took a giant step towards retaining their Coca-Cola Top Four trophy when they beat Accra Hearts of Oak 2-0 in their encounter at the Ohene Djan Sports Stadium in Accra on Wednesday. Faisal who drew with Hearts in the first leg match will now have the luxury of playing their remaining matches at the Kumasi Sports Stadium where they hardly lose. Ironically was Hearts who first came close to scoring when in the 10th minute, their new acquisition, Wisdom Ablexo from Power F/C over- elaborated when he was put through to allow the Faisal defenders to recover and clear their lines. Faisal from then on took control of the game and pressed hard for the opener, which duly came their way in the 13th minute from the boot of Ben Wilson who fired in a shot from the edge of the box after Eric Gawu had cleverly stepped the ball over to him. The early goal paradoxically brought more bite and life into the game of Faisal as they restricted the CAF Confederation Cup champions to their half in a bid to double their lead. Strangely, the home team noted for its fighting spirit in recent matches, surrendered to the hard running Faisal midfield under the command of hardworking Eric Gawu, Ben Wilson and Kwabina Poku. To make matters worse for the home team, Faisal doubled their lead in the 24th minute when Abubakar Yahuza connected home with a spectacular overhead volley to a cross from Ben Wilson to leave Saani Mohammed in Hearts posts stranded. The response from the Hearts bench was immediate when they brought on Eric Djamgba for injured Daniel Coleman in the 25th minute. Hearts gradually settled down and put some pressure on the defence of Faisal in an attempt to reduce the tally. They nearly came close in the 40th minute when a header by Agblexo nearly dropped into the Faisal net but for the agility of keeper Suraj Mohammed. The second half resumed in a similar fashion as the first half with Faisal dominating the early exchanges and they nearly extended the scores in the 52nd minute when Gawu's goal bound header was cleared off the line by Djamgba. Hearts made their second substitution in the 57th minute with Wisdom Abbey coming in for Agblexo but the change did not yield the desired effort upfront. Play was temporary brought to a halt in the 72nd minute when one of the assistant referees was pelted with sachets of water after he flagged against Hearts, which the supporters deemed unfavourably. 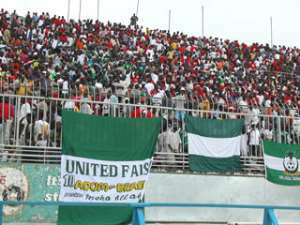 When the game resumed, Faisal did not let of as they continued to dominate till the final whistle by referee John Atikese.